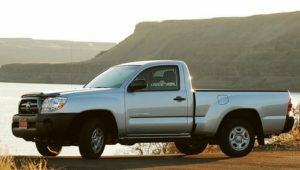 Although there has been no official statement from Toyota at the present time, a number of otherwise credible sources have reported that the once popular Toyota Tacoma regular cab truck will be discontinued for the 2015 auto year. Slacking sales and recent trends in consumer preferences have made regular cab trucks seemingly obsolete in terms of profitability and consumer value, replaced by larger models such as crew and extended cab models. In fact, competitors of the Toyota Tacoma such as the Nissan Frontier have already jettisoned their mid-size models in pursuit of a larger market – and now Toyota is poised to follow. From an objective overview Toyota is making a prudent business decision in this instance for a number of valid reasons. Not only have sales fallen in recent years on the Toyota Tacoma regular cab but the gap in consumer prices between extended cab and regular cab trucks regardless of make have closed considerably. To the consumer this means a few extra thousand dollars spent at the dealership equates into a larger truck with greater seating capacity and a much wider possibility of potential uses. While the overall gas mileage of the extended cab vehicles may be reduced the inherent advantages make them a prudent purchase on several economic levels. Within the automotive industry the move is simply a matter of survival in keeping up with the competition. Truck manufacturers in general and Toyota specifically can no longer afford to absorb the production costs associated with catering to a niche market that is shrinking annually – namely fuel conscious small business owners and private owners with limited expectations. Although a quality truck in it’s prime, in essence the regular cab Toyota Tacoma has outlived it’s acceptance in the current marketplace plain and simple. For loyal fans of the Toyota Tacoma the 2015 model will be eagerly anticipated and should hold a number of interesting and useful upgrades designed to accommodate consumer needs and choices. Unquestionably Toyota possesses the knowledge and creativity to produce yet another outstanding Tacoma model, the only real differences in the next generation will equate to a larger size and a expanded range of uses.